What’s immediately obvious about the Gazzetta della Strada is the fact that it’s a beautiful bike. Its steel frameset harks back to the material’s halcyon days in the Eighties when, as a 15-year-old schoolboy, given a choice between a hot date with Kylie Minogue or a road machine fashioned in Reynolds 753, Australia’s newest pop princess wouldn’t have seen me for dust as I disappeared over the horizon on my 14-speed ‘lightweight’. At a glance, the Gazzetta has all the bases covered, with its classic lines, understated clean alloy drivetrain and 32-spoke rims, but in truth, it’s a rather pale imitation of the old-school machines it mimics. At 12.6kg it’s definitely no lightweight, and neither is it ideally suited to the ‘sporty urban riding’ (whatever that is) which Cinelli cites as the Gazzetta’s raison d’être. The drivetrain, that at first glance looks so elegant, is actually Shimano’s reliable but unrefined 2300 set, while the budget factory-strung wheels are a world away from the hand-crafted hoops favoured by yesterday’s roadmen. However, at its heart beats a well-thought-out and well-put-together Columbus frameset with some nice touches. The angles are sporty, and are partly responsible for the bike’s apparent resemblance to an Eighties lightweight, although a slightly sloping top tube betrays its modern provenance. Diamond reinforcement details around the bottle bosses are a nod to days gone by, although it loses points for the rather industrial welds and the uninspiring sloping crown steel fork. 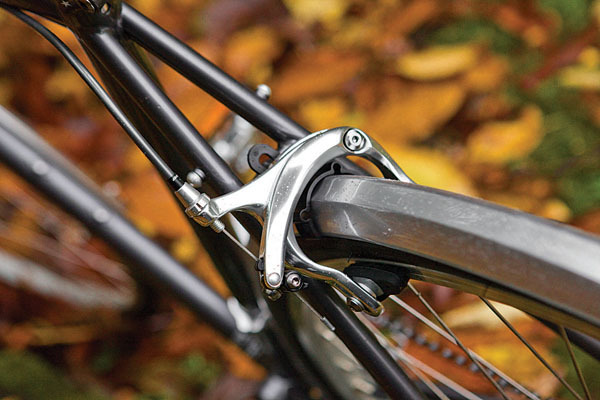 The deep drop brakes are unbranded and are operated not only by the standard STI shifter set-up, but also a pair of bar-top levers. These are included, no doubt, to make the bike a little more suited to the round-town riding for which it’s designed. They’re a neat and worthwhile inclusion on a bike like this, but unfortunately anything you decide to put on the dinky front rack (designed for handbags and rucksacks, apparently) is probably going to get in the way of using them a bit. Out on the strada, the Cinelli winds up to a decent speed in a fashion that belies its weight, on the flat at least. And once it’s rolling, it’s a bit like riding an elegant flywheel — the momentum carried by all that mass, aided by the substantial 28c Kenda tyres, means the Cinelli bulldozers over poorly surfaced roads, minor potholes and debris without missing a beat. 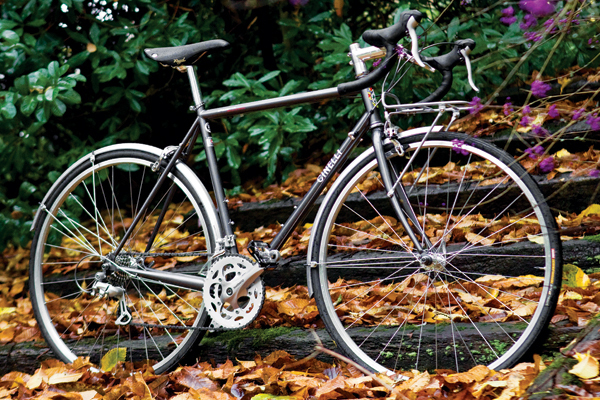 Compared to a lightweight carbon race bike with 23c tyres, it’s an absolute armchair ride. When it needs reining in, those no-name calipers keep the whole affair in check adequately, a job that can be done equally effectively from the shifter levers or the bar-top ones. This is a minor revelation, because these bar-top add-ons can vary in their usefulness, but in this case, coupled with the high-ish front end, they make the tops of the bars not just safe, but the preferable position when scooting through heavy traffic. The Shimano 2300 shifters click through each of the eight speeds on the cassette in a workmanlike fashion, without pomp, but perfectly accurately nevertheless. The set-up demonstrates perfectly that Shimano, with its much lauded trickle-down ethos, doesn’t really do duff kit; the practical reality more or less boils down to the fact that its more expensive stuff looks nicer and weighs less than the cheaper stuff. However, the Shimano experience isn’t necessarily perfect, as clearly demonstrated by that pesky, poorly placed thumb-shifter that used to be featured on the Sora group, and still comes on current bikes with 2300. It stuck in the base of my thumbs when riding on the hoods and, seeing as I don’t have freaky monkey hands (I don’t think), it was impossible to use from the drops. Thankfully, once all the 2300s have been sold, the fiend will never again see the light of day, as the new 2014 version (2400, oh yes), features proper paddle shifters like the rest of Shimano’s road kit. About time! So the Gazzetta features an attractive collection of plus points, but where exactly would it fit into your stable of steeds, or indeed could it serve as your only, do-it-all bike? For all Cinelli’s claims that the Gazzetta is for ‘sporty urban riding’ I’d suggest that if you are interested in sporty riding you’d feel hampered by its weight. Taking the word sporty out of the equation leaves you with a more realistic idea of where this bike would come into its own — in an urban setting. It’d make a great machine for short commuting journeys, and with those looks it could do double-duty at the weekend when you want to pose around town. 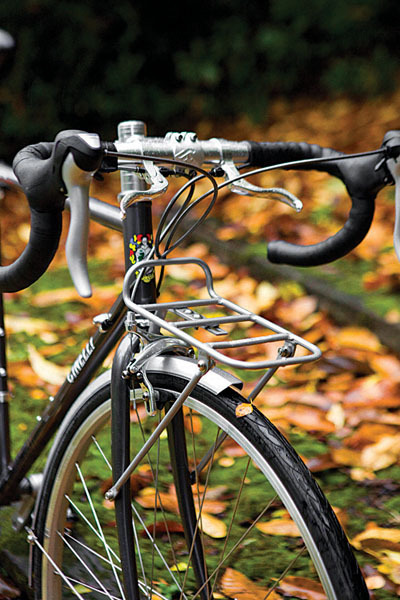 Assuming that the budget wheels are up to the job, you could also add a rear rack and go touring. It’s a heavy bike, but it’s still a kilo lighter than Dawes’ benchmark tourer, the Super Galaxy (though without the spread of gears), so if you don’t mind forgoing any kind of ‘sporty’ riding, it could take you on a lengthy trip. There is a niggling feeling that you could find a considerably cheaper, and lighter road bike that would allow you to do all of these things equally well, and for less effort on the hills. That may very well be true, but you wouldn’t look quite as good doing it. 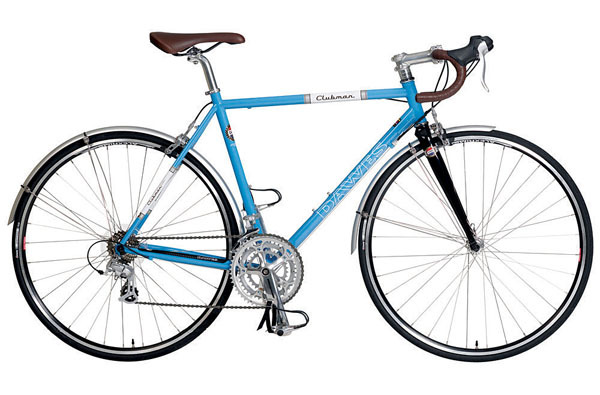 Is the Dawes Clubman the bike that the Gazzetta would love to be? Or is it the other way round? While the Clubman isn’t quite the looker that the Cinelli is, it’s not far off; and it does an arguably better job of mimicking our fabled lighweights of old. Indeed this great Briton weighs more than a kilo less than our Italian stallion, and the leather-look bar tape and seat are a real nod in the retro direction. There are still plenty of 2013 models around — they can currently be had online for around £700. Bargain.